It is good to have different parts of the boat to work on as a diversion. 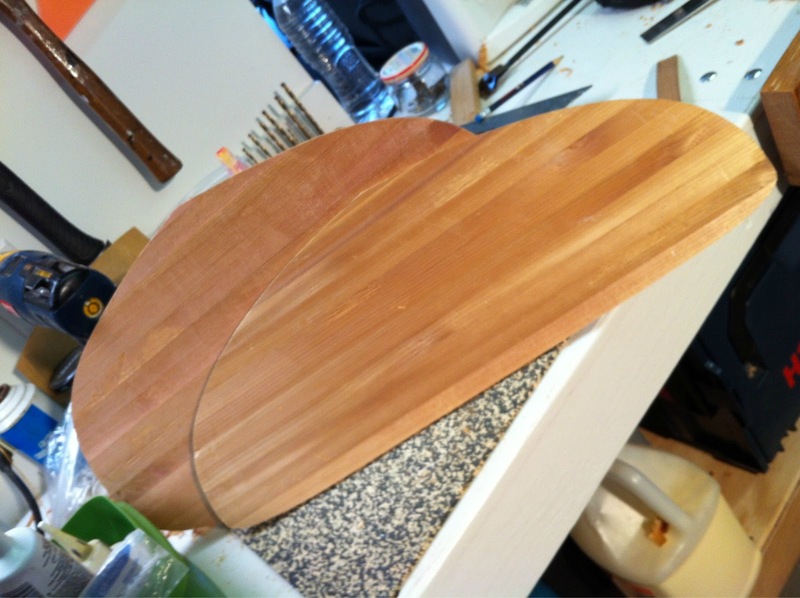 The making of the selected bulkheads was quick and simple. Over waxed paper that protected a full scale form outline the varying strips were glued, clamped, and held with hot melt. While that sets another strip is cut and edge glued. Repeat until form outline is covered. Finally the clamps are removed and the whole is weighted on a flat surface for carpenters glue to cure. Bulkheads 6 & 11 trimmed & scraped. 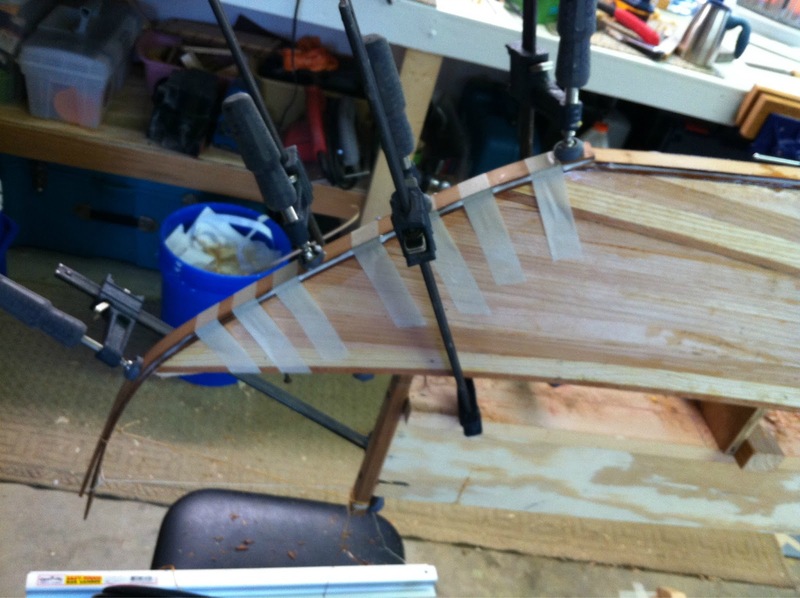 Bow with top cheater strip glued & clamped. 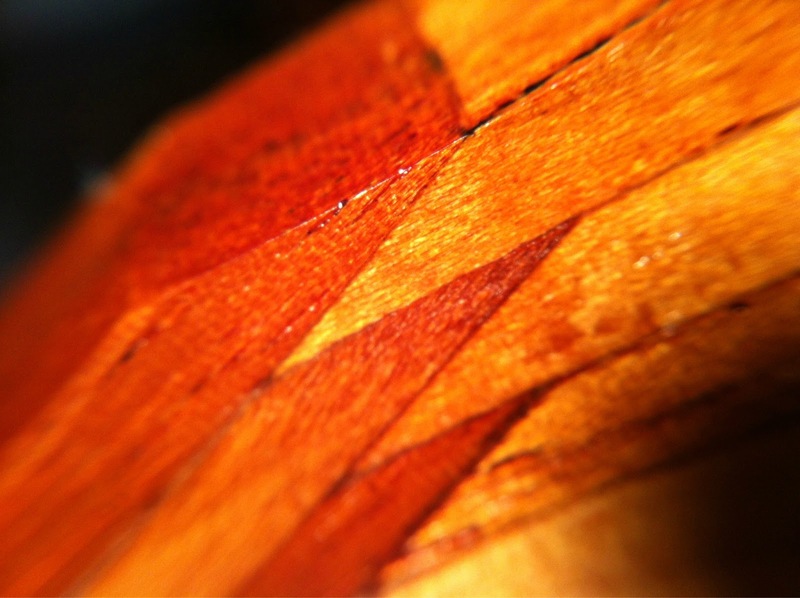 Once cured the hot melt is scraped off and the entire surface is planed smooth. Then the paper form is spray mounted to the bulkhead, trimmed close with a hand saw and finally hand planed to the paper outline. Yesterday I ordered 3 gallons of epoxy (Raka’s UV Inhibited). It claims to be ” second to none in its ability to resist blushing, UV breakdown, color change< white clouding and water spotting”. We will see. ” Also purchased was 32 yards of 4oz cloth and 50 yds of 2″ tape. While 2 gallons should be adequate, I did not want to be caught short … and at a 2:1 ratio of epoxy to hardener, smaller quantities were almost the same price (surprise). bulkheads. The theory being that a hard landing on a rock will be more forgiving as opposed to a potential shear point with a hard bulkhead. More people tend to use hard bulkheads and I do not intend to go white water kayaking in this touring boat. Sometimes 1 clamp won’t do. Last cheater in! Added the 6 cheater strips to the bow. I now have the technique down. The 1st one on the stern took over 2 hrs and was poor at best. The last here took maybe 20 minutes and filled the taper quite well. The trick? Cut a strip a couple inches longer than the wedge to be filled. Make sure the grain is smooth and runs across and away from the pointy end. This eliminates the chance of cracking off part of the cheater (guess how I know. Twice!) 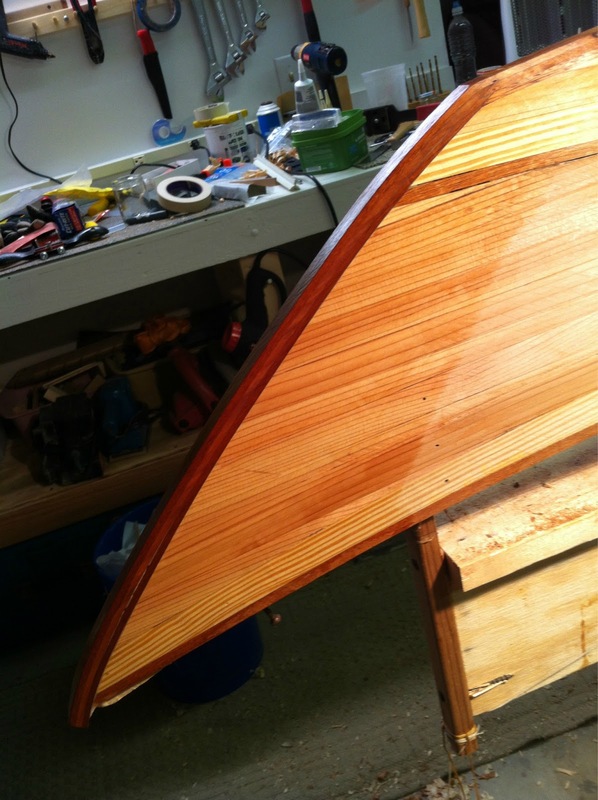 Since the wedge is curved in reality you must take a half dozen measurements of the gap at roughly 3-4″ intervals and make them on the trim piece. Use a wood batten to connect these dots. 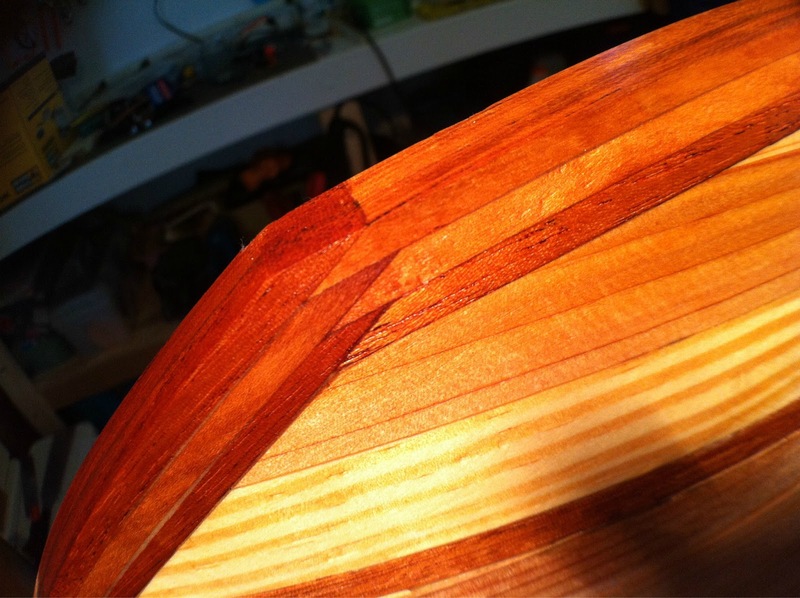 Grab your sharp sturdy pocket knife to trim close to the line and finish with the plane. Test fit and plane some more. I left a slight bevel toward the inside of the hull. I think this allowed for some error in a spot no one is likely to ever see. Ah! one more thing: having a smooth board nearby and a chair to sit in as you address the work area makes all this more pleasant than arduous, well, at least eventually. It is all about learning. Now for the outer stems. 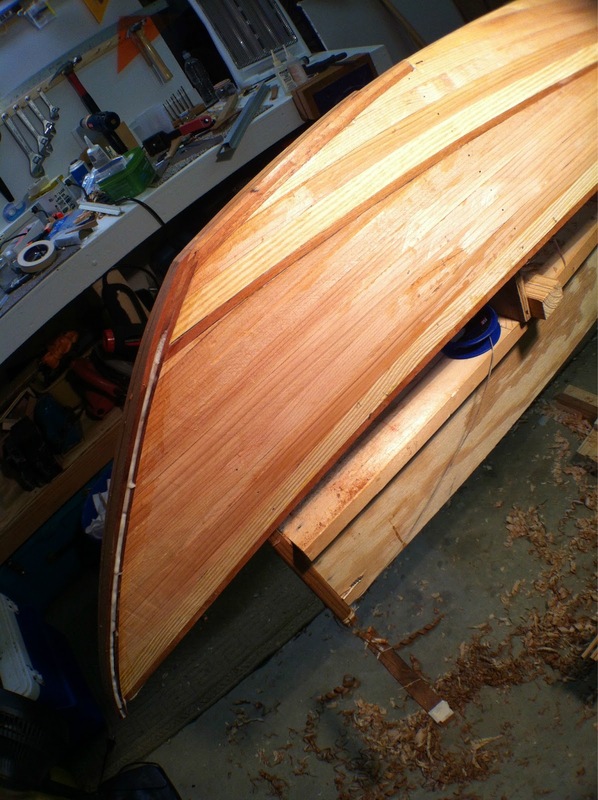 I chiseled a “chin” off the keel to accept two 1/8″ strips of mahogany and cherry laminations. Why both woods? Because that is what was in my scrap pile in the shed. The heat gun will allow for these strips to bend along the stem easily. 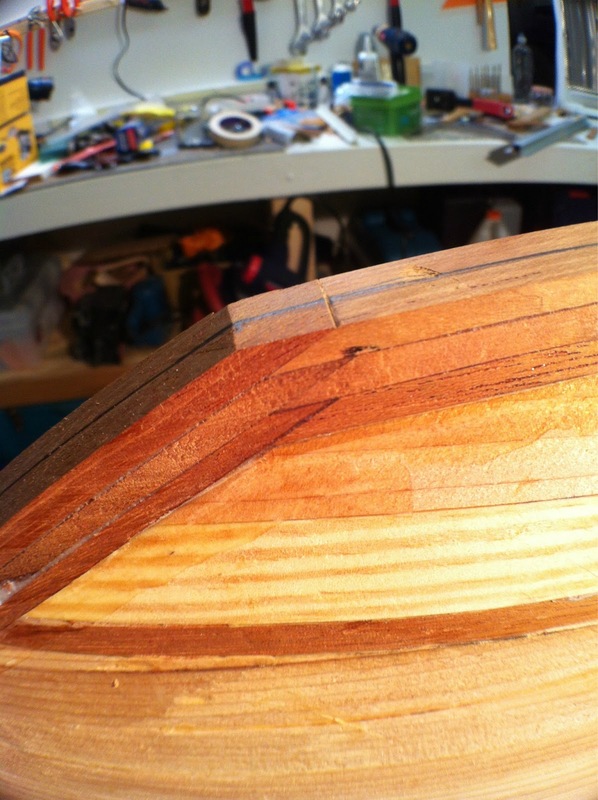 Once the stem is planed and sanded square to the keel, thicken some epoxy and slather it on. 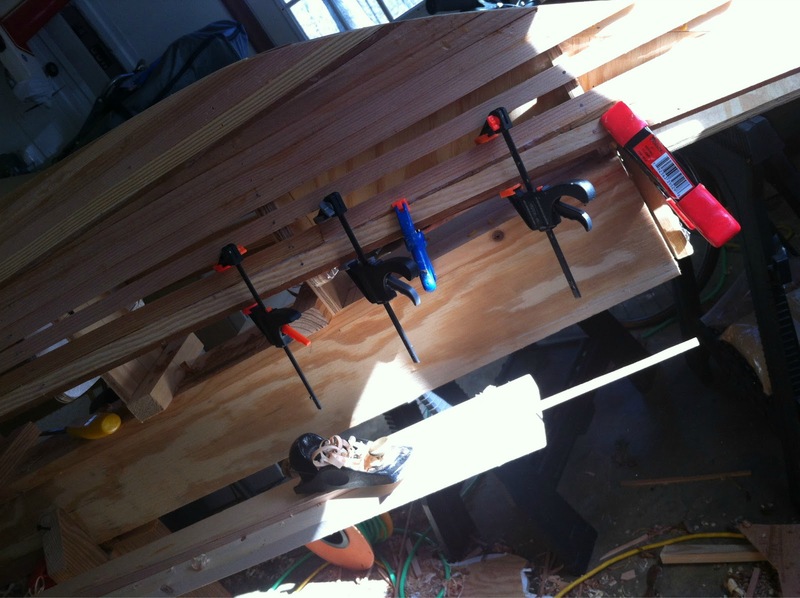 Masking tape helps hold the strips in position for clamping. 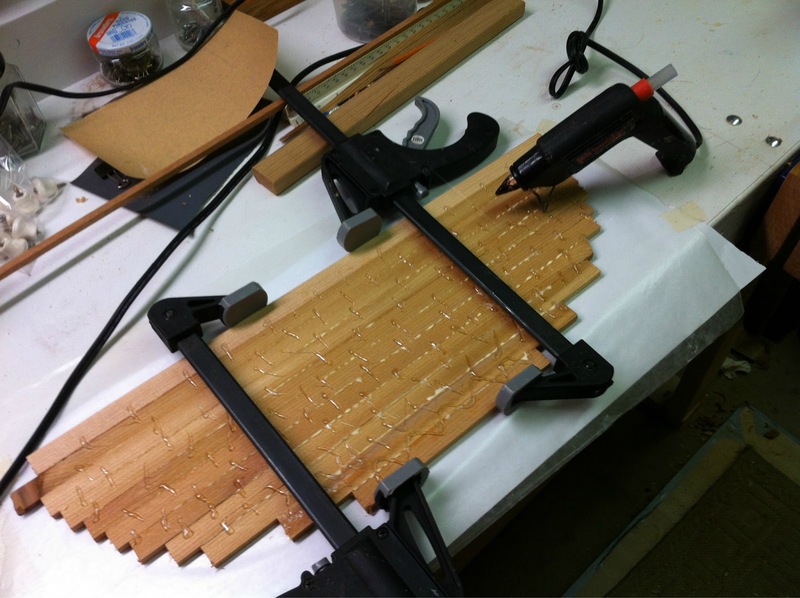 You must get good epoxy squeeze out, but don’t clamp so hard as to make the joint dry. 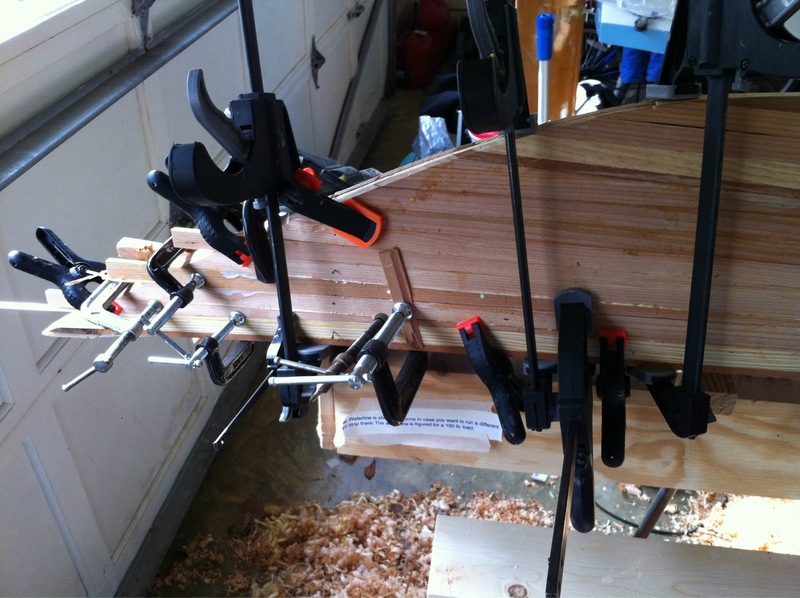 Make sure the clamps remain in place. I left the garage for an hour and returned to see a clamp on the ground. This resulted in the joint opening in that one location. Fortunately it is small enough to be filled with dust & epoxy later. Shaped stem with hit of color. After 3 laminations on the stem, I shaped with a plane while being careful to reference a pencilled center line so as not to remove too much wood. I had to spread a little mineral spirits on the result to get an idea of the final look. Fantastic! even with the nail holes, which again, I think I’ll leave. Nice saw joint on the chin. 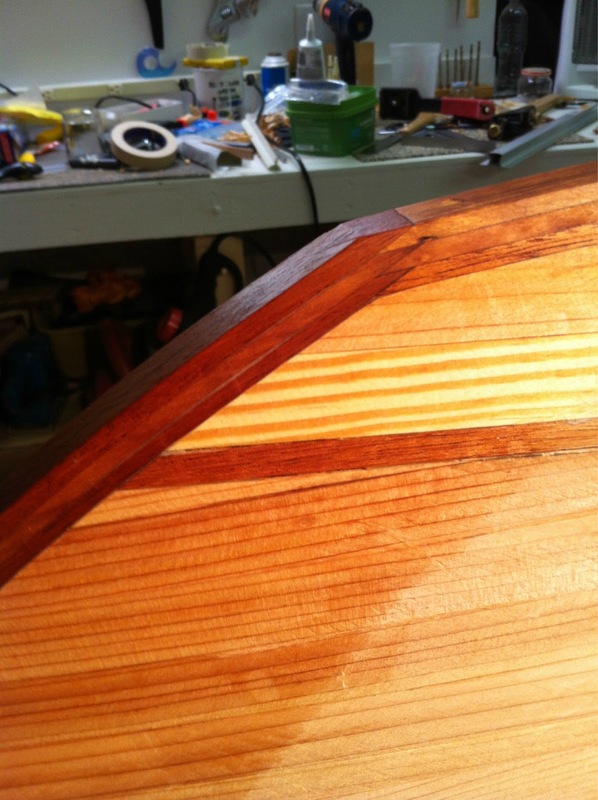 While I hate working with the yellow pine, it does look good here against the mahogany. On to the bow stem … the lines don’t have this chin, so it should be easier. I’ll post a final pic on that. Now at the 80 hr mark and almost ready to sand. Snowing this morning so we’ll wait for better weather as I want to keep the dust outside. I bought a $5 wide angle & macro lens for my iPhone and have played a little with it. 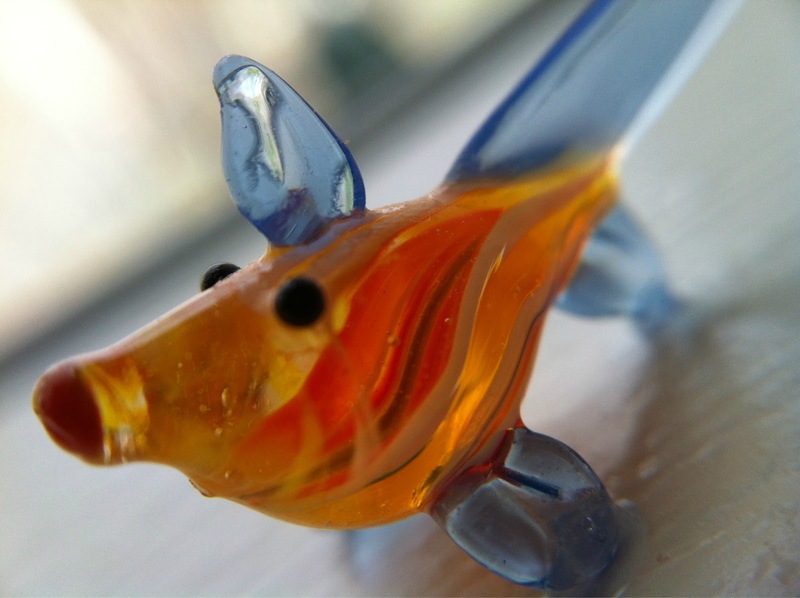 Here is a wide angle shot followed by a macro and then a macro of a mini fish souvenir from sailing in Maine. Lens works well I’d say. Macro: glass fish. 1/4″ tall.